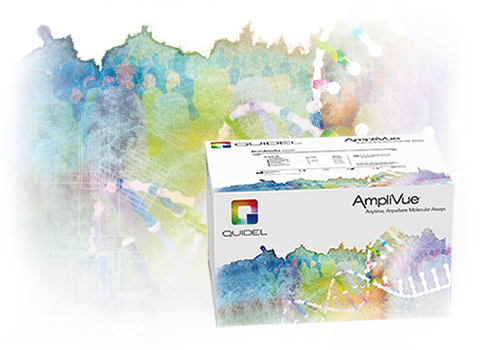 The AmpliVue Bordetella Assay is an in vitro diagnostic test for the qualitative detection of Bordetella pertussis nucleic acids isolated from nasopharyngeal swab specimens obtained from patients suspected of having respiratory tract infection attributable to Bordetella pertussis. The assay utilizes helicase-dependent amplification (HDA) of the insertion sequence IS481 and a self-contained disposable amplification detection device that allows for visual evaluation of assay results. A buffered sample is lysed by simple heat treatment, aliquoted and added to a Reaction Tube containing lyophilized mix of HDA reagents including primers specific for the amplification of the insertion sequence IS481. Competitive amplification of the process control DNA takes place unless amplification inhibitory substances are present or the sample processing fails. After completion of the HDA reaction, the Reaction Tube is transferred to a Cassette for rapid detection with the test result displayed as test and/or control lines in the window of the Cassette. The dual-labeled probe-amplicon hybrid is then detected by the lateral flow strip within the Cassette. The bottom line captures the test amplicon and the top line captures the control amplicon. The biotin label binds the streptavidin-conjugated color particles for visualization and the molecular test result is shown as colored lines visible to the naked eye. Easy-to-use format, just rehydrate and add sample. Reagents are stable at higher temperatures than liquid reagents.